Summer in Grand Haven is awesome. The beach scene is fantastic and the food along the channel is the perfect summer time fare. In the winter, Grand Haven can still be pretty awesome, but Pronto Pup and Butch’s Beach Burrito’s close up until it gets warmer. Fortunately, Butch’s has a second, year-round location. 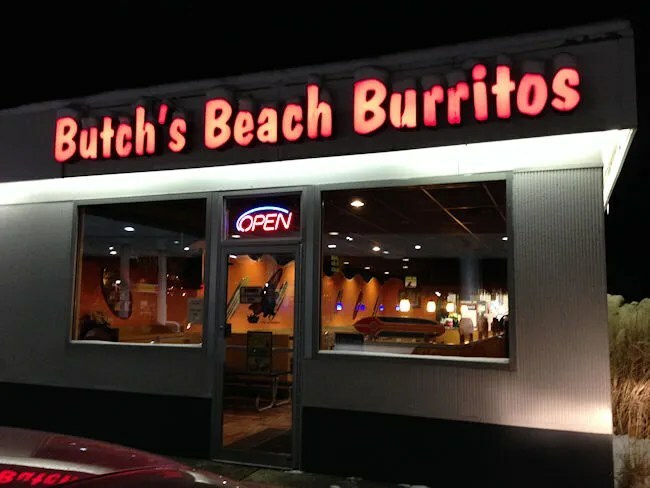 The Spring Lake location for Butch’s Beach Burrito’s is just to the east of downtown Spring Lake inside the Shell Gas Station on M-104 (Savidge Street). The location has a fairly large dining room, but just doesn’t have the atmosphere of the location in Grand Haven. The order counter is in the back of the space. A co-worker and I pulled in not too long before closing time, but we were far from the last people to order dinner from Butch’s that night. There was no one eating in, but there was a steady line of customers for take out pretty much the whole 10-15 minutes we were there. The fare at Butch’s is pretty standard Mexican food. There’s nothing too crazy on the menu. It’s mostly just burrito’s and tacos. However, they did have a special on Enchilada’s that night and that’s what C.W. went with. Stopping at Butch’s was her idea. She has eaten there many times in the past and always really liked the place, but this Enchilada was a miss for her. What was wrapped up in the flour tortilla was fine, but she said the Enchilada sauce tasted like Cream of Mushroom soup. She wasn’t on board and I’m not even sure she finished it. The price was right for the Enchilada, but in the end, she wishes she would have shelled out a little more for a burrito that she knows she likes. As for me, I wasn’t even going to eat dinner, but I walked in with her anyway and the urge for tacos hit me. 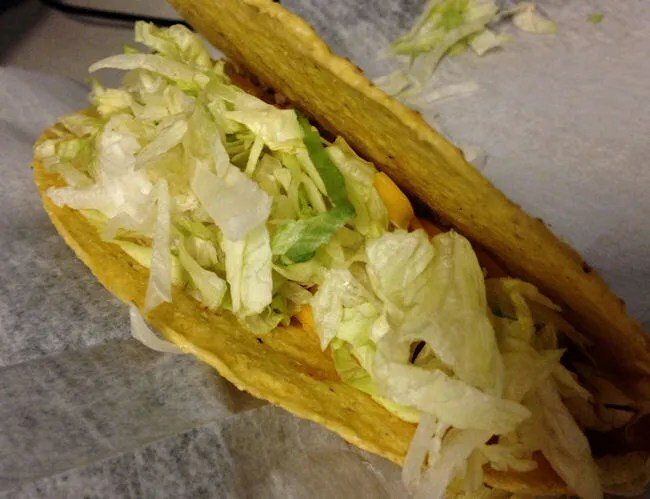 I ordered four beef tacos with lettuce, cheese, and salsa. They asked if I wanted hard or soft. The soft option was flour tortillas, so I went for hard. The crunchy tacos are stuffed with ground beef then topped with choice of salsa (I went for the medium option), lettuce, and cheese. These were really good tacos and I’m almost 99% positive it was the salsa that really made them stand out from the tacos at similar restaurants. The salsa wasn’t hot, but it just had this really good, kind of sweet flavor that made me want to scarf the tacos down as fast as I could. I was pretty hungry, so I also added on Chips & Cheese. Not really sure what I was expecting here, but the side dish was a container of tortilla chips topped with shredded cheese that was melted on top of the chips in the microwave. There was nothing inherently wrong with this other than the price. It wasn’t the most complex side dish I’ve ever had and for $5, it didn’t really feel like it was worth the price. It was good. Don’t get me wrong. I liked it..just wish it wasn’t so expensive. I could have gone for less chips to save on the price a little. My bill for the five tacos and chips & cheese was just a little over $12 with tip. That’s really not a bad price for dinner…at least for me. My tacos were fantastic. I will be stopping there for just that probably every time I go to Grand Haven now. 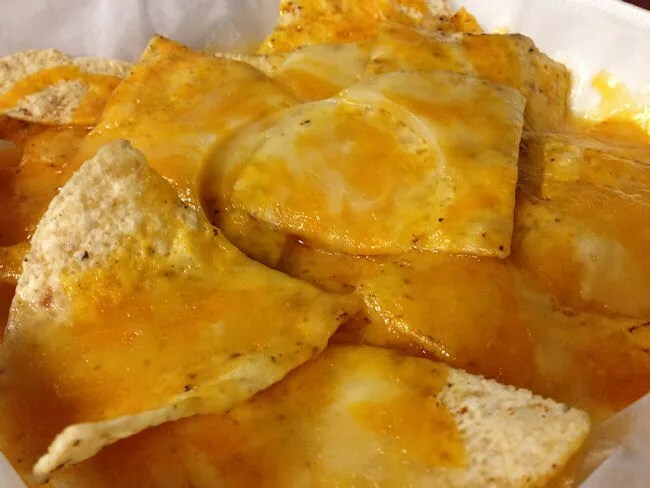 While the Chips and Cheese was alright, I don’t think that’s something I’ll be trying again. They have other chip options that offer a little more food for not very much more in price…that’s something I might try again. In the end, however you look at it, Butch’s Beach Burrito is a great little Mexican joint. It’s quick and it’s delicious. You can’t ask for much more.